Two crazy goalkeeping mistakes and an all-time great goal from substitute Gareth Bale earned Zinedine Zidane his third European Cup in three attempts. Zidane decided to use his diamond midfield here, meaning Isco started instead of Bale, with Karim Benzema leading the line. Jurgen Klopp’s side was as expected – injury problems meant he didn’t really have any selection dilemmas. Zidane’s key decision was deploying Isco rather than Bale, which meant Real Madrid lined up with a midfield diamond rather than a 4-3-3. This had a significant impact upon the shape of the game: it meant Real played very narrow and offered absolutely no width down the right flank throughout the first half, meaning Liverpool left-back Andy Robertson was generally the out-ball whenever Klopp’s midfielders assessed their options. Zidane was clearly keen to overload the midfield and ensure Real Madrid had a numerical superiority in midfield, although it’s questionable whether this made sense against Liverpool’s energetic midfield press. In the early stages it rather played into the hands of Liverpool, who were able to press in a relatively small area rather than being forced to work across the pitch. Isco’s presence in this Real system is peculiar: he unquestionably adds extra passing quality and offers tremendous trickery in tight positions, but he also ends up playing on top of Real’s other midfielders which harms the structure of the team and meant they struggled to bypass Liverpool’s midfield press. 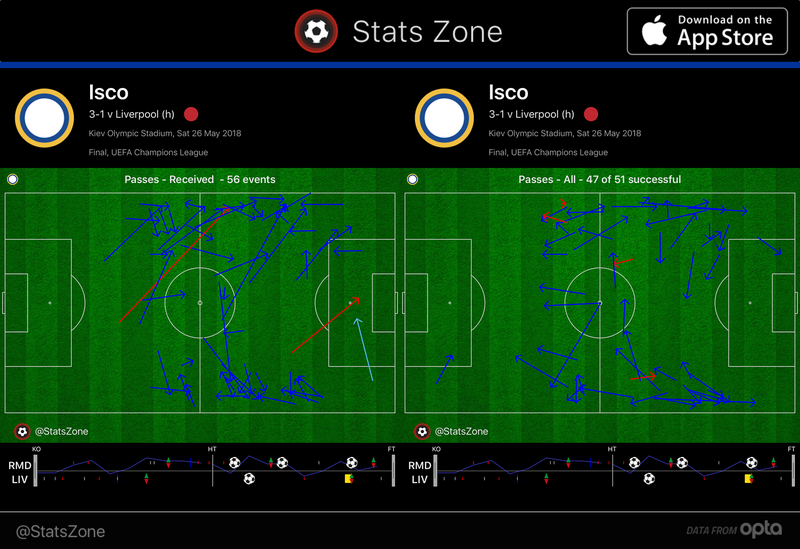 The extent of Isco’s free role is outlined in his passes received and played. He was wandering all across the pitch, almost always playing safe backwards balls rather than penetrative passes. 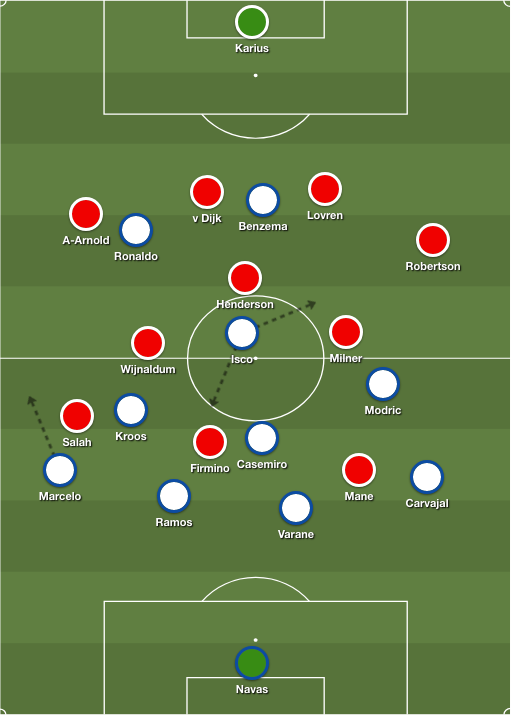 Liverpool’s pressing was more considered and cautious than we’ve witnessed in previous matches – they tended to stand off and attempt to win the ball inside the middle third, rather than on the edge of the opposition area, although there were some exceptions in counter-pressing situations, with Roberto Firmino typically excellent at working backwards to pressure Casemiro. Real seemed rather unsure how to play against this press in the opening stages. Whereas other side would launch the ball forward to bypass the press, Real were largely concerned with making their numerical advantage in the centre of the pitch count. So they repeatedly attempted to play slow passes through Toni Kroos and Luka Modric, while Isco and Benzema also came deep to overload the centre. But Liverpool snapped into action quickly, boxing Real in towards the flanks with the winger on the opposite side of the pitch pushing inside to pressure one of Real’s centre-backs. Real’s full-back on the far side was often free, but they rarely located him with crossfield balls in the opening stages. Liverpool forced spells of pressure and had some decent half-chances, but you sensed that Klopp’s side needed to score in the first 20 minutes, to justify their early exertions and to allow themselves to play on the counter-attack. The longer the game continued, the more Real’s possession play would tire Liverpool. That expected pattern played out almost perfectly, albeit influenced heavily by the departure through injury of Mohamed Salah after he was flattened by Sergio Ramos. Salah’s departure robbed Liverpool of their most dangerous attacking unit – he’d already breezed past Marcelo twice – and meant Klopp had to summon Adam Lallana, who is a very different type of player, and has struggled badly in terms of fitness this season. Mane moved into Salah’s position with Lallana playing from the left. Shortly afterwards, Dani Carvajal limped off and Nacho came onto replace him. Klopp might have considered moving Mane back to the left, to target Nacho – a good defender, but not a natural full-back. Instead he continued down the right, and offered Liverpool’s main threat. Now, however, Real started to dominate. Kroos and Modric drifted into wider positions – see below – enjoyed more time in possession, and Real started moving the ball laterally across the pitch between the full-backs, forcing Liverpool to work harder without possession. Now Liverpool struggled to get the ball into the opposition half, and Real steadily increased the pressure. Isco now used his free role to find space in dangerous positions, and from his cross, Cristiano Ronaldo’s header was saved, and Benzema’s foll0w-up was ruled out for offside. Isco was again heavily involved at the start of the second half, hitting the bar after Ramos had surged forward. But then things changed dramatically with Karius’ astonishing error for Benzema’s opener, seemingly putting Real in control. Liverpool, however, responded impressively, forcing a spell of pressure and Mane grabbing a close-range equaliser from a set-piece. Now the game opened out, and Zidane decided to remove Isco – a curious decision considering he was heavily involved at this stage – and introduce Bale. While Bale largely played from the right flank, making Real’s system more 4-3-3, he covets Isco’s free role and soon wandered into more central positions. After just two minutes on the pitch, produced the outrageous bicycle kick to put Real ahead. It stemmed from a long spell of Real possession, an apt summary of the situation throughout the second half. Liverpool, by this point, seemed exhausted and Klopp had no serious game-changing options from the bench, certainly nothing in the mould of Bale. Emre Can, another who has suffered from injury recently, was introduced in place of Milner but had little impact, because in the same minute Bale’s long-range shot was inexplicably spilled into the net from Karius. Another Bale goal, another Karius mistake, another Marcelo assist, another Real Madrid European Cup win. This game was about individual moments rather than the tactical battle: Salah’s early departure was a devastating blow for Liverpool, and Real’s three goals consisted of two goalkeeping howlers and a moment of individual magic. That’s maybe the best way to summarise Real’s recent European Cup triumphs: their wins often defy logic, they have often found themselves outmanoeuvred and Zidane’s tactics have been questionable, but they’ve consistently found a way through in the final third. Real’s early struggles were arguably because Zidane didn’t play Bale wide in a 4-3-3, and they took command after he switched to that system. Isco was both a help and a hinderance. Ronaldo increasingly offers little if he’s not scoring and was largely anonymous here – although finishing as this competition’s top goalscorer six times in a row is an incredible achievement. From Liverpool’s perspective, it felt like they needed to score in that opening period of high-tempo football – they were always likely to suffer when Real’s possession football took charge during the middle period, and when Real’s superior substitutes were introduced in the closing stages. But ultimately it’s impossible to ignore Salah’s injury, or Karius’ mistakes. 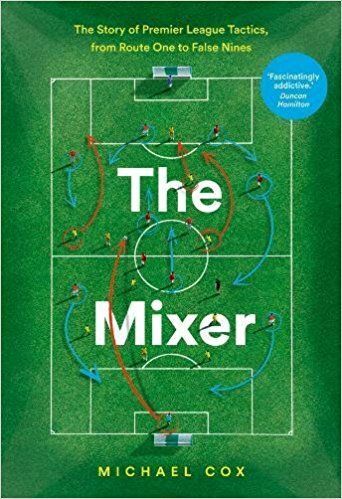 I’ve written a book about the tactical development of the Premier League over its first 25 years. You can buy it here! Ronaldo looks like he is turning into a shadow of the player he used to be. Vintage Ronaldo would have sealed this game up in the first half with his chances. And Klopp was aggressive but accurate in his tactics much like in Dortmund vs Real Madrid. However you can not overcome two howlers by their second rate goalkeeper. Disappointed by how the game evolved. While in the firt 20 minutes it looked like the game that would be decided by tactics, it turned out to be a game decided by everything else except tactics. But that’s football. Bloody hell. In some ways it was decided by tactics. Real’s experience helped a lot. Modric and Kroos got to grips with the tempo after Liverpool’s strong-ish start. Liverpool did all they could admirably after losing Salah; Real had a lot left on the bench to change the match. Like every year, it’s time to give the awards for the 2017-18 season. Manager of the season (overall): Pep Guardiola. The way his team stormed this year’s EPL is extraordinary. Remember, we were talking of the most competitive Premier League season of all time back in August, and City won it with 32 victories in 38 games. Even if Barca had won the La Liga undefeated, my award would still have gone to Pep. Manager of the year (Champions League contenders): Domenico Tedesco. Last year I gave it to Julian Nagelsmann, and I’m happy that another young manager has done a brilliant season in Germany this year. A honorable mention should also go to 73-year old Russian maverick Yuri Semin, who unexpectedly led Lokomotiv Moscow to league victory over much richer teams, after 16 years. Manager of the year (mid-table): Betis’ Quique Setien should get this, but a close second is Burnley’s Sean Dyche. Manager of the year (relegation battlers): Tayfun Korkut (Stuttgart). It’s. Not. Even. Close. This guy took a team in the relegation zone in late January and made them Europa League contenders. Girona’s Pablo Machin comes second. Best attacking performance: Salah @ Liverpool-Roma 5-2. Tactical switch of the season: While for some it may have looked obvious after the departure of Neymar, Barcelona’s adaption of a 4-4-2 played out extremely well and made them a very solid team this season. Breakthrough player of the season: Naby Keita. Best player of the season (overall): Mohamed Salah. Messi may’ve had an incredible season, but Mo was an absolute BEAST this year. He deserves this honor. Wow there is still someone who believes it was not a penalty by Benatia? And no candidates from Real Madrid the champion? Who should I have as a candidate from Real Madrid this year? These aren’t just Champions League awards, but for the whole season..
Last year my list was full of Real Madrid players (and Zidane) as it was truly a splendid season. But this year? Who? As for the penalty, it actually turned out to be the least important factor in Madrid’s winning of the CL. After all, of the three teams who played Madrid in the knockout stages (PSG, Juve and Bayern) Juve were the ones that had the least bad referee decisions against them. Best individual attacking performance: Ronaldo against Juve at their ground. Single handedly pulled the team through. The game was totally open before his second goal.Salah was great against Roma but Roma played wrongly from the beginning. They made everything easy for LPool and Salah. Navas against Bayern at Bernabeu. De Gea was outstanding against Arsenal but this was a champions league semi final and Madrid couldn’t stop Bayern creating chances at all. Navas was the only thing between Bayern and a CL final. But if I had included so many Champions League performances, wouldn’t then I be criticized for not including the leagues? Last year I gave “best attacking performance” to TWO Ronaldo games (the 3-0 vs Atleti in the CL semifinal, and the 3-0 against Atleti @ the Calderon in the league). I also remember giving the award to Zidane for the tactical switch to diamond 4-4-2 mid-season, to Casemiro for the midfield performance in the final against Juventus, to Ronaldo for overall best player of last year, and to Zidane as second-best overall manager. So, I would’ve been criticized if I had including so many Real Madrid players again, but because I didn’t do so, I’m now criticized as a “hater”, LOL. I admit I was wrong not to give at least a honorable mention to Navas in the goalkeeping performance. Actually, I did think of it but by that time I couldn’t edit the post, as the 2 minute deadline for editing posts had expired. Spin it as you like but not recognizing even ONE candidate for the champions league winner is absurd. I expect salty Liverpool fans to go this low, not a football analyst. So great to see a ZM article again Mr Cox! Your website was what changed my view of football and has enhanced my enjoyment of it for nearly a decade. 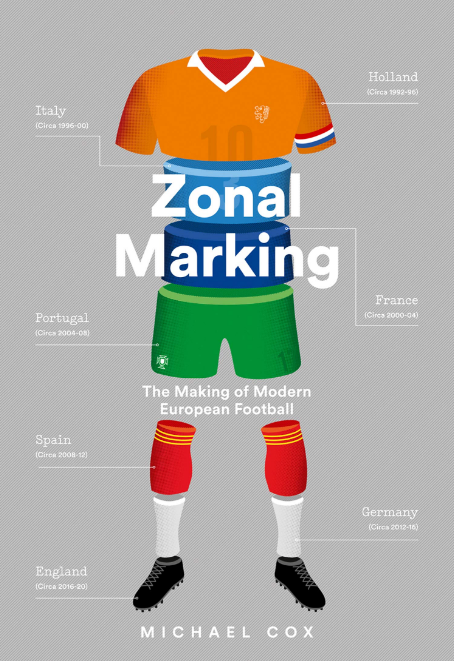 I know you have a lot of other commitments these days but would be great to see some world cup articles and a future top 20 teams of the 2010s (similar to the top 20 sides of the 00’s article you did way back when). Keep up the great work! Reason Zidane opted with Isco, is to defend better – Isco individually marked Handerson, and that freezes LFC bulid-up play. instead most of the time the just play long ball, easy recovered by Madrid. In other times, Real just switched to 5-3-2 with Casemiro droping into defence, and Isco in line with Morrić and Kroos. And that worked well, if LFC make some noise in Real defence, that’s by press and early recover(at beginnig of a match), but most of the time via set pieces. But for such a offensive potential, LFC createt far less chances than expected. When Zidane decided to go with Bale, LFC was already exhausted, their presing was not as effective, and they have no valid options on bench – most of danger was behind Real, and it was perfect moment for litte lover def. contribution, in order to strike. And fast Bale, perfect to counerattack,was man to do it. Zidane had plan from beginnig, and executed step-by-step. Liverpool had 9 shots before Salah left and none after. That’s all you need to say about this game. Yeah. It shows how depended Liverpool was on Salah. A one man team with no plan B does not deserve the title. Not true. Liverpool scored after Salah left the game. So were they not so depended? Then why this guy brings on “the 9 shots before the injury vs after”? Mane was their best player and doesn’t get the recognition he deserves for his final performance. That’s a pity. Are they “depended” or not? Are they a “one man team” or was Mane their best player? Are you bipolar or just a troll? Thanks Anne, so glad you’re enjoying it!